The recently elected aldermen for City of Sparta were administered the oath of office during the Aug. 16, 2012, meeting of Sparta Board of Mayor and Aldermen. 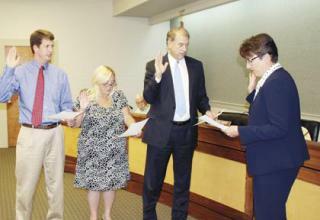 L-R: Dr. Chad Griffin, Judy Parker Payne, Robert Verble, and Lynn Omohundro, attorney for City of Sparta who administered the oath. Parker and Verble were re-elected to their positions, while Griffin is a newcomer to the political arena.